Many companies invest a lot of time and money in content marketing. But very few are ever really successful with it. That’s because a lot of companies approach to content marketing as some sort of hands-off sorcery. They write blog post after blog post and then sit around and wait for something to happen (hint: nothing will happen). Instead, you should think of content as a type of currency – a strategic asset that you can use within a framework to drive business results. This requires a plan and a strategy for how you will use content and then which kind of content you need in order to accomplish those goals. Today, I’m going to share an advanced framework that you can use to put your content to work. 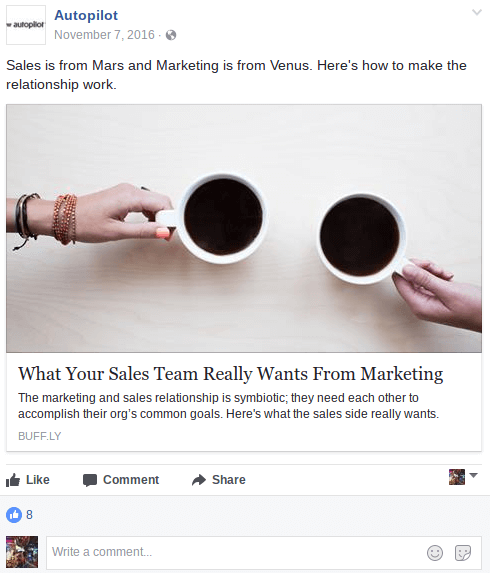 With this two-step acquisition strategy, your content can become more than just a blog post; it will be a tool that helps you fill your funnel with laser-focused, qualified prospects that you can convert into customers. To start this post, I want to reframe the way that we think about content. Often, marketers use content as a sort of filler. It’s just an activity that you do in order to promote your product. Blog, share, blog, share–something is bound to happen, right? But, I want to scrap that idea. Instead, let’s ask more from our content. Ask yourself, for each piece of content: How is this creating value? If it’s not creating value in some specific, measurable way, then why bother? For this case study, we are going to assign very specific roles to our content. We’re going to use it as a strategic asset to help us accomplish a number of specific goals that will help grow your company. Seems like a lot to accomplish, but it can be done with the right approach. We talk a lot about the sales/marketing funnel and how we should work to move strangers through the funnel so they become leads, prospects, and eventually customers. In most cases, this is a good framework for thinking about how people move throughout the buying process. But, in this case we’re going to simplify the steps and use content to do some of the heavy lifting. To execute this strategy, we are going to start with something that will probably make most of you cringe. But, wait–don’t quit reading just yet! Let me explain how we use clickbait strategically. Clickbait is top-of-the-funnel kind of content. It’s emotional, visceral, and (generally) a bit fluffy. But if we think about why clickbait is so effective, we can uncover a strategic insight that we can use to make it work more effectively as a marketing tool. This clickbait content is effective at generating engagement because it’s relatable or interesting to a specific group of people. They have an emotional reaction to it. 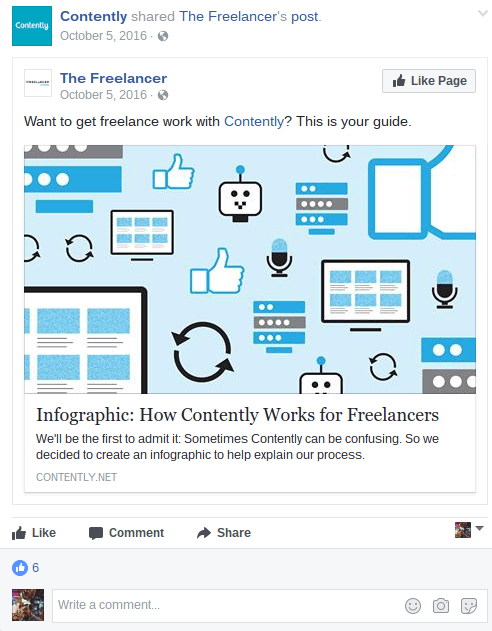 A perfect example of how this works is an article that I’ve seen promoted by Contently. This may seem like a run-of-the-mill listicle with no serious marketing value. But, just stop and think for a second. Who is most likely to click, share, and engage with this article? If you guessed, “people who work from home,” you win an (imaginary) prize! Now, we have a pretty good idea that everyone who clicks/reads this article likely works from home. And, like magic, we can build a retargeting list of people who have engaged with our brand and told us that they are likely a remote worker or interested in remote working. This is the power of clickbait. It’s not (only) fluff and junk that floats around the internet if you use it correctly. It can be used to build a laser-focused audience of qualified prospects. We want people to self-identify–to tell us something about themselves–just by clicking. Now, what do we do with this little trick? At this point, we have a piece of “clickbait” that is helping us attract a very specific group of people to our site. This is good–but we have to do something with these people. The difference between being a publisher who uses clickbait just to drive eyeballs and a marketer who uses that clickbait to actually drive leads, conversions, and sales is this second step. Surprisingly it’s not that difficult. In fact, you probably already use it: Retargeting. But, in this case, we have a secret advantage. Rather than retargeting some big group of website visitors with a generic message or broadly segmenting those visitors and showing them “relevant” ads, we can really drill down to very specific audiences and interests. 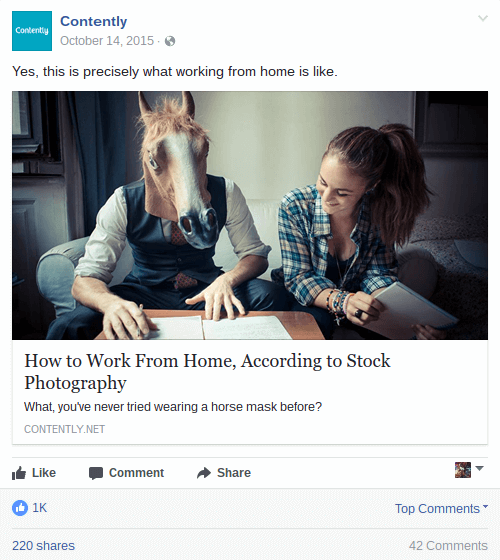 If we’re trying to reach this specific audience segment (e.g., remote workers), we can simply throw them into a retargeting list based on their interaction with this post. 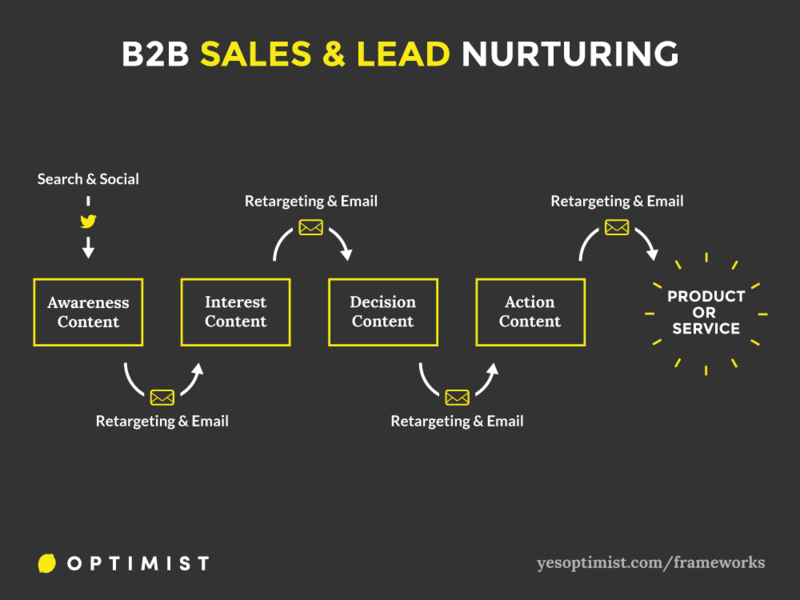 Now we can nurture them with down-funnel content, direct response offers, webinar promotions, etc. In the case of Contently, a big part of their business model is maintaining an enormous network of freelance talent. So, by building a list of remote workers (likely to be freelancers), they can start to qualify and nurture those people toward joining that network, which is likely one of their high-level business metrics. This audience will be more likely to respond to these offers because they’re warm to our brand (versus a cold audience found through ad targeting) and we also know that they are interested in the kind of content/offer that we’ll show them. Just like that, we have created a scalable and repeatable system for building a laser-focused list of prospects and then moving them through the funnel. Repeat this for various audience segments, offers, and products. As I mentioned above, this entire process is built on a few key strategic insights about the way that we, as people, use and consume content. Clickbait is built on personal relevance and self-identification. That’s why it’s so effective at generating engagement. People use content as a currency of self-expression and exploration. So, if we use it strategically, we can gain insights into a prospect’s implicit and explicit preferences, behaviors, and identifiers. This goes above and beyond what you can accurately target using Facebook’s ad platform, for example. 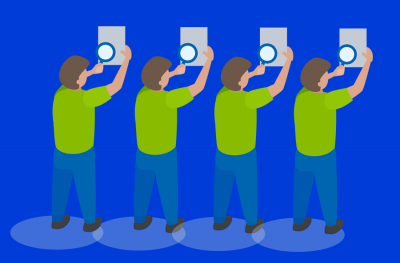 Many brands skip the first step of this process and simply target a relevant audience with calls to action and direct response ads. For some companies, this may be successful. But, as most of you probably know, the more engagement your content receives, the lower your cost per engagement will be. Therefore, having more “viral” content–, e.g., clickbait–will generate more results at a lower cost versus down-funnel content or product offers. We use this to our advantage to both achieve our strategic objective of qualifying prospects while also loading our funnel up at a lower cost than if we used product-focused content or ads. It’s probably not a groundbreaking statement to say that a “warm” audience–or, people who are familiar with your brand–are more likely to click and convert on your content or ads than those who you simply identified through ad targeting. In studies, retargeting improves conversions by 300-400%+ and reduces costs by 73%. Many companies retarget their website visitors. But, this strategy allows you to engineer some of that initial brand awareness and affinity, then cash in on it through retargeting. The net effect is more conversions and lower customer acquisition costs. The specifics of executing this kind of strategy will be different for each product/service or industry. But the basic moving parts remain the same–the mechanics work for many different kinds of companies and organizations. Let’s look at how you can apply this in a few other cases. 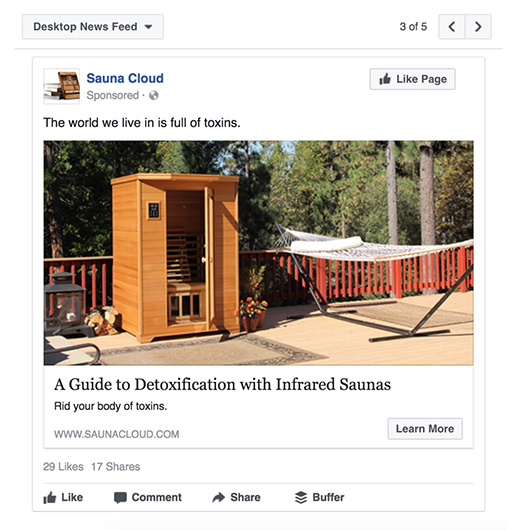 Sauna Cloud sells premium infrared saunas that offer a variety of healthcare benefits. They use a strategy like this to fill the top of their funnel based on specific health benefits. 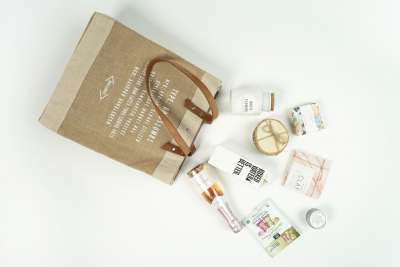 This add warms up prospects by introducing them to the product on the basis of a specific health benefit that they’re interested in achieving. 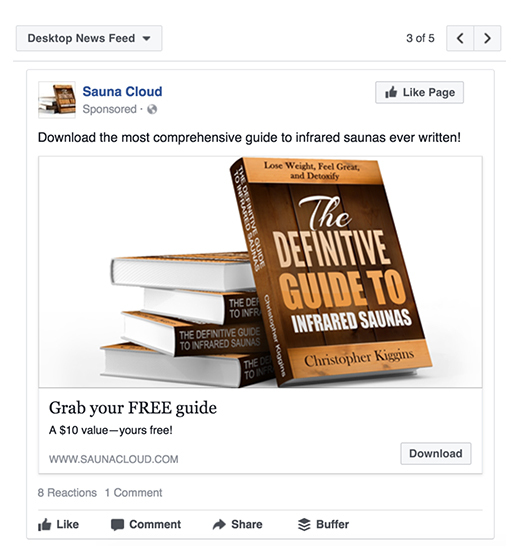 “It’s all about introducing people to your brand with high-quality, accessible content, then converting them at a later date,” says Chris Kiggins, founder of Sauna Cloud. Then, they follow up with an offer for a downloadable ebook. Those who request the ebook get put into a lead nurturing campaign and get a follow-up sales call. They’re able to generate qualified sales leads for less than $5 to for a product that sells for between $2,000 and $6,000–not bad. Many SaaS companies find success at driving traffic to their content but often struggle to convert them into users. In many cases, this is because they expect a user to magically find their way from a blog post about a topic to a product page that explains how the service would help them solve the problem. This is the wrong approach. 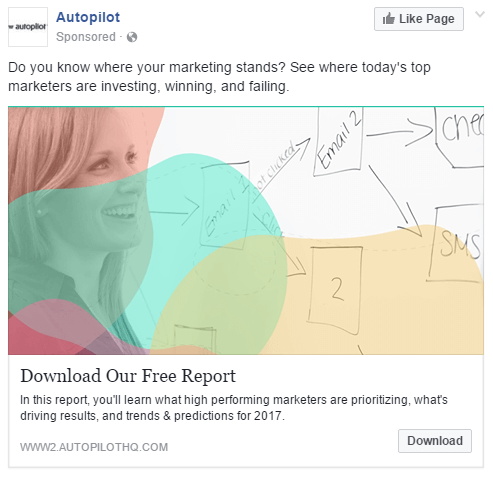 Instead, a company like Autopilot will use their content as a top-funnel opportunity to load up leads and then use further content to nurture them into prospects and buyers. This may seem like a “normal” blog post–but look at the way it’s positioned. “What Your Sales Team Really Wants From Marketing” implies that you work for some kind of a company with a sales team and that you’re likely part of marketing. Just with this simple phrasing, they have helped identify the people who should read the article, and likely created a target audience of the people who will, indeed, click on the link. They’ve just gone from targeting an audience of warm marketers to (hopefully) generating real leads with a free download of their industry report. For nonprofits, the strategy is slightly different. 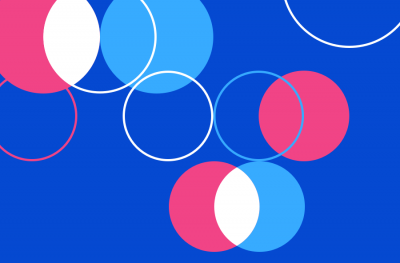 The framework is the same, but the top-funnel content should be about targeting and identifying people who care about a particular cause or issue rather than necessarily having some defining identity or characteristic. 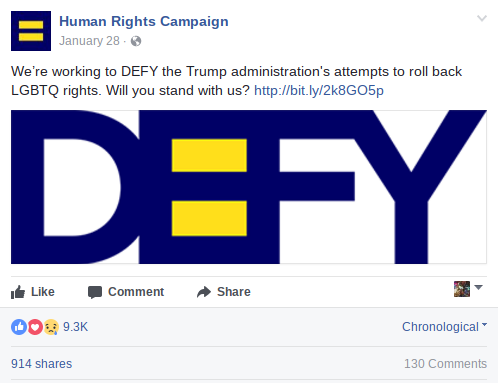 Human Rights Campaign (HRC) does this masterfully by targeting people who support LGBTQ rights right their frequent news content. These posts go viral (6,100+ shares! 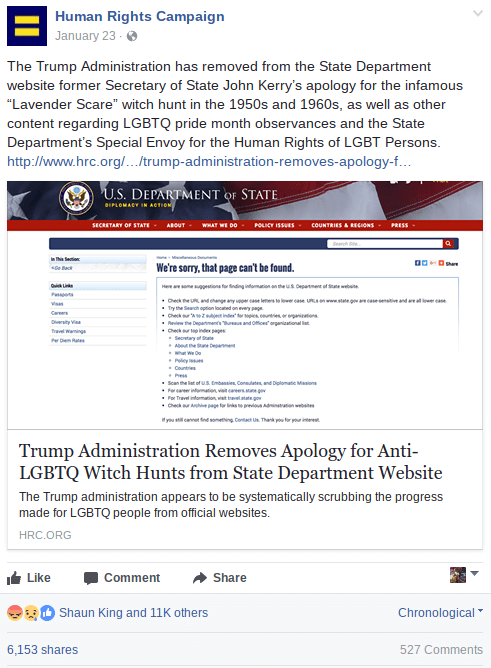 ), generate engagement, and give HRC an audience of passionate supporters to target with donation requests down the road. Their calls for donations and volunteers use for specific language that targets the issues they have been mentioning in their news and blog articles. One of the reasons I love this approach is that it’s so repeatable and scaleable. Almost any type of company or organization can use it to increase the effectiveness of their content marketing and advertising strategies. Too often, content marketing is done as a disjointed “blogging strategy” with no real direction or actual strategy to speak of. This is why many companies spend time and energy on content marketing and fail to achieve their goals. Focus on creating systems and ways use that content strategically in order to drive results, and you’ll be able to accomplish more than just blogging and sharing. Effective content marketing frameworks are how you truly create value with content. About the Author: Tyler Hakes is strategy director at Optimist, a full-service content marketing agency for startups, SaaS companies, nonprofits, and technical/creative agencies. He’s been helping companies grow through strategic content marketing and SEO for nearly 10 years. Follow him on Twitter.